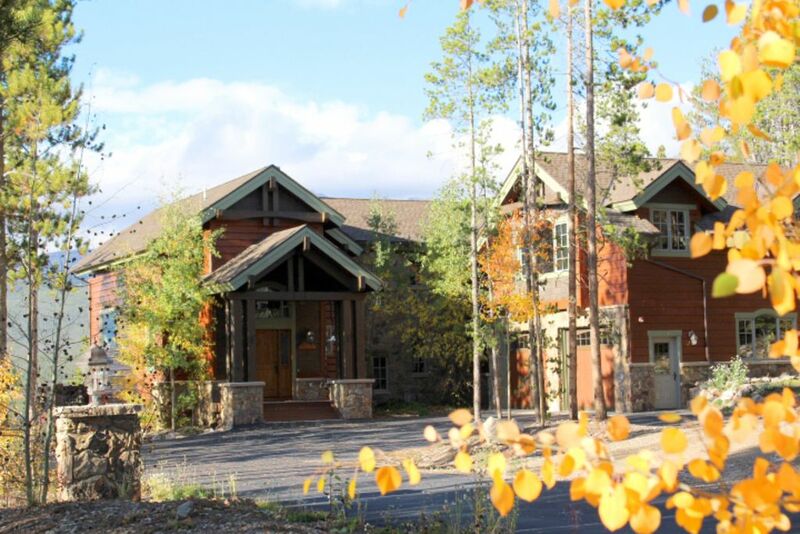 Bella Monte lodge, the best that Breckenridge has to offer! This executive home feels like a big mountain lodge with high end finishes throughout from granite countertops and high end appliances to comcast HD big screen TV and sonos sound. Home is also perfect for Weddings! Home has 'Breck Air' air conditioning.....1 window open for low, 2 windows for medium and 3 windows for high! Located up Boreas Pass Road. Walking distance to bar, restaurant, and on the year round free shuttle route, there are hiking/biking/cross country ski trails out the back door. Many guests hike the trail into town and take the shuttle bus back. Lay in bed watching TV and see three 14,000 ft mountains and numerous 13,000 ft mountains along with Breckenridge ski area. Views are the best you’ve ever seen! Wedding or large group and need more space? There’s a hotel bar-restaurant a short walk away and plenty of off street parking. Large party tents, chairs, tables, heaters, etc can be rented locally and hooked onto the two car garage. In the winter you have the free sledding hill in within walking distance, and yes there are sleds at Bella Monte. Several cross country ski trails including the famous “Baker Tank Trail” are within a mile of Bella Monte. The free shuttle bus takes you to the gondola to access all of world famous Breckenridge ski area, enjoy après ski in town, drinks, dinner, and shopping, and then come home on the free shuttle anytime up until midnight. In the summer take the free shuttle to the Peak 8 fun Park including the famous alpine slide, bungee trampoline, maze, mini golf, or take a mountain bike up the lift and ride trails down the mountain. Simply hop on your bike, go 10 miles downhill to Frisco and take the free shuttle all the way back to the lodge with your bike. Inside the home find a master bath with a large Jacuzzi tub and a large steam shower with 3 shower heads. A real motorcycle, canoe, and moose mounted on the wall in the living room makes it unique. Extra large kitchen with commercial gas stove, double oven, and meal seating for 18 make meals at home fun. Big screen TV in the living room can be watched all through the upstairs with sonos sound in the kitchen and throughout the house as well as outside. Downstairs find another big screen TV with surround sound, wet bar and foosball. Four of the bedrooms are suites with baths; the fifth bedroom has bunk beds with bath across the hall. There are three gas fireplaces inside and one outside, on the deck. Imagine skinny dipping in the private (blocked from view) hot tub that’s half under the deck for full snow enjoyment with mountain views in the background. The lodge is well stocked with games and books along with DVD’s. Ed and Diane Beaumont purchased Bella Monte Lodge in 2005. The name Bella Monte means “beautiful mountain” in both Italian and Spanish and Beaumont in French. We call it a lodge because we seem to always fill the place; breakfast for 16 or more is pretty common. Diane is a Branch Manager/Owner of Benchmark Home Mortgage originating loans in both Summit County and in the Woodland Park area while Ed is in Real Estate. We have five children and four grandchildren. We also have a home in Colorado Springs. We both back country ski and down hill ski in the winter. With the abundance of trails in the area we enjoy back country as well as downhill. Taking the grandkids and visiting children to the Carter Park sledding hill is also one of our regular activities. We love the quiet off season with two for one dinner specials and other deals found in the free Summit Daily News. Summers find us on our dirt bikes and ATV along with hiking and mountain biking. Every mountain you can see from the lodge, 10 in all, we have either hiked to the top of or rode our dirt bikes to the top. We have hiked every mountain pass in Summit County and mountain biked nearly every trail. We frequent the $29.00 “happy hour golf” deal at the Breckenridge course and have golfed on every course in the county. There is so much to do in Breckenridge year round that time goes by too quickly! Picture Note: Ed & Diane are on the top of Father Dyer Peak, with peak ten in the background, Dillon reservoir to the right of it and Belle Monte Lodge is on the far right. We chose to purchase in Breckenridge because Diane and I both love the outdoors and we never run out of things to do here. Swinging Ski chair on the front porch, new bar-restaurant next door, best views you'll ever see. Quiet and out of town yet shuttle bus or drive to town in a few minutes. Breck air conditioning 3 windows open for high, 2 for medium, one for low. Recliner couch. Hall closet has blow up mattresses for additional beds. Table sits 10. 4 on bars and 4 on Breakfast table in kitchen . Highchair can be found in the mud room closet. direct TV with NFL package including red zone channel. Parking off street for 6+ cars. More parking available. This was our second time staying at Bella Monte, everything was fantastic and the skiing was awesome. We got 3 feet of snow over three days and glad we had an AWD vehicle to get in and out of town. It was a real pleasure staying at this house. Cant get any better!!! Thank you for everything! Fantastic view and tremendous house for large group! Everything was superb for our large and varied (by age) group of family and friends. Also being pet friendly is an added bonus. it was perfect in every measurable regard. From the floor plan to the views to the decorating to the equipped kitchen to the cleanliness to the convenient location to the hot tub and the heated floors, it lacked nothing. We couldn't hesitate reccomend this home for your ski vacation. We will certainly be back. It's the absolute best value it the region. Alpine slide with adventure park, music, concerts, mountain biking, hiking, fly fishing, children's museum. $5,900 over 4th of July week. $5,900 over Thanksgiving week. Our pay schedule is as follows: 1/3 at the time of booking, the remaining 2/3 due 15 days prior to check in. Cleaning Fee is added for rentals less than 1 week in length.